This article is about the novel. For the film, see The Nanny Diaries (film). 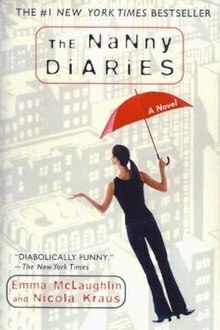 The Nanny Diaries is a 2002 novel by Emma McLaughlin and Nicola Kraus, both of whom are former nannies. The book satirizes upper class Manhattan society as seen through the eyes of their children's caregivers. 4.2 Ryan Hutchinson aka "Harvard Hottie"
The writers were students at New York University's Gallatin School of Individualized Study when they wrote the book. Both had worked as nannies for about 30 different wealthy families on the Upper East Side, where the book is set. As a child, Kraus lived at 1000 Park Avenue, and claims she modeled some of the characters, particularly Mrs. X, on other building residents. A film adaptation starring Scarlett Johansson, Paul Giamatti, and Laura Linney was released in the United States on August 24, 2007. The novel was also released as an audiobook, read by actress Julia Roberts. In 2010 Kraus and McLaughlin released a sequel called Nanny Returns, in which Nan and Ryan (aka Harvard Hottie) are married, and after having lived abroad for twelve years, they have returned to New York, where they move into a fixer-upper, and Nan hopes to start a business. One night, a drunken, 16-year-old Grayer shows up at their door, demanding to know why Nan abandoned him years earlier, and thrusting the couple back into Mrs X's life. Originally in college when the first book began, Nanny Schuester was the primary nanny to Grayer X, and eventually began to love him as a son. Mrs. X fires her after the interaction between Nanny and Grayer, jealous that her son sees Nanny as a mother over her. The X's force Nanny to leave without letting her say goodbye to Grayer, something that haunts her. In a rage, Nanny records herself on the "NannyCam", accusing the X's of being bad parents and begging them to love their son. While working for the X's, Nanny meets and falls in love with a boy who lives in the same building as the X's, someone she nicknamed "Harvard Hottie", as that is where he went to school. In the sequel, Nanny Returns twelve years have passed since the conclusion of the first book. Now married to Harvard Hottie, they move back to New York after spending six years traveling the globe through his UN program. There, a sixteen-year-old Grayer turns up on her doorstep, drunk. Still feeling guilty for how she left when Grayer was four, she decides to help him anyway she can in order to atone for what she did. Thus, this brings her back in with the X's, who have not changed in the past twelve years. However, putting all her focus on helping Grayer puts a strain on her relationship with Harvard Hottie, who feels like it is not her place to be Grayer's "nanny" anymore. Ryan Hutchinson aka "Harvard Hottie"
Originally living in the same building as the X's, HH runs into Nanny in the elevator while she is hanging out with Grayer. Nicknamed Harvard Hottie by Nanny (as he attended Harvard), they begin to gain a rapport, however their relationship almost crumbles when she runs into him and his high school friends, who he doesn't stop when they insinuate that she is only a nanny so she can have affairs with the rich husbands. However, after much apologizing, they begin a relationship. In Nanny Returns, Harvard Hottie (his real name was revealed to be Ryan Hutchinson) is now married to Nanny, and after moving around the world due to his UN duties, decide to move back to New York. However, their relationship gets strained because he wants to immediately start a family while she is hesitant to do so. He also does not support her getting sucked back in into the drama of the X family, as he knew that it took a toll on her the first time. Grayer's mother, Mrs. X is self-centered and not a very good mother. Leaving all the parenting work up to Nanny, Mrs. X spends most of her time in seclusion or spending money. However, she doesn't like to spend money on others, as she poorly compensates Nanny for working overtime and fires workers whenever she feels like it. Her relationship with her husband is almost non existent, due to his constant cheating and his constantly long work hours. However, she begins to grow jealous of Nanny once Grayer starts seeing Nanny as his mother over her. She then fires Nanny and prevents her from seeing Grayer one last time. In Nanny Returns, she is just the same as ever, although she now has another son (from Mr. X). She becomes severely depressed, due to Mr. X leaving her for a younger woman. She kept Nanny's video from the "NannyCam" in case she had to sue Mr. X for custody of their children. However, she finds out that the reason that her husband had so much money was that he was a con artist and the police were starting to suspect him. Not wanting to lose the lifestyle she has (as she will get nothing in the divorce if he is caught), she decides to turn a blind eye. However, Grayer tells her that he will financially support her when their father gets caught only if she acts like a real mother to her other son. The very much non existent father of Grayer. He is married to Mrs. X but continually cheats on her with other women. He similarly works very long hours at his office and would rather not be a father to Grayer. In Nanny Returns, it is revealed that he is a con artist, which was how he was able to get so much money. He tried to convince Grayer that he wanted to spend quality time with him, but actually wanted to use him to steal something. He also has left Mrs. X for a younger woman, and cut off much of the money she was given. The son of Mr. and Mrs. X. He is four during the events of the first book. He becomes very close to Nanny and begins to see her as his mother, as his own would constantly neglect him and his father would ignore him. Unknown to him, Nanny was fired due to a jealous Mrs. X and prevented Nanny from saying goodbye to him, something that emotionally scarred him as he grew up. In Nanny Returns, Grayer is now sixteen with a seven-year-old younger brother. He shows up on Nanny's doorstep drunk, after having seen the "NannyCam" video and looking up her address from his mother's files. He is still hurt by Nanny's seemingly abrupt disappearance from his life, as she was the one person who really cared for him. Thus, he does not trust her, however he wants his brother to succeed, so he enlists Nanny's help. He eventually finds out why she had left so suddenly, and he forgives her. He decides to move out of his mother's house and live on his own, as he realizes that his father and mother never really cared for him. Nanny offers to adopt both him and his brother, but he turns her down, saying he needs to do things on his own. He promises to stay in touch, however before he leaves Nanny gives him a charm that he gave her when he was four, telling him to always remember their time together and to never forget, because she never has. ^ "". Amazon.com. Retrieved January 28, 2014. This page was last edited on 14 October 2017, at 03:30 (UTC).